I spotted this recipe in the 11/24/18 issue of the Wall St. Journal. It makes a tasty dessert with a stronger lemon flavor than is usual with apple desserts. The next time I make it I will probably use a cake pan rather than a pie pan so that there is less chance of boil over. The original recipe called for Golden Delicious apples, but since I did not see any at Kroger, I replaced them with Granny Smiths and added a little extra brown sugar. This could be easily done in a Dutch oven when car camping. To make the crisp topping, mix together in a bowl the dry ingredients. Add the cubes of cold butter and work them with your fingers until a dough is formed. Sprinkle on the vanilla and work a little more to incorporate it. Refrigerate the dough at least an hour before using. To make the apple-custard base, start with a deep 9-inch pie pan (or cake pan). Peel and core the apples, cut them into large chunks and put them in the pan. Mix in the lemon juice and zest. In a small bowl, mix together the cream, brown sugar, cinnamon (or other spice), egg yolk, egg, apple brandy or rum, and vanilla extract. Pour the custard mixture over the apples. Add the crisp topping to the top of the apple-custard mixture, and press the topping into the base to help it adhere. Put the pan on a baking sheet lined with aluminum foil, baking parchment, or a silicon mat for any overflows. 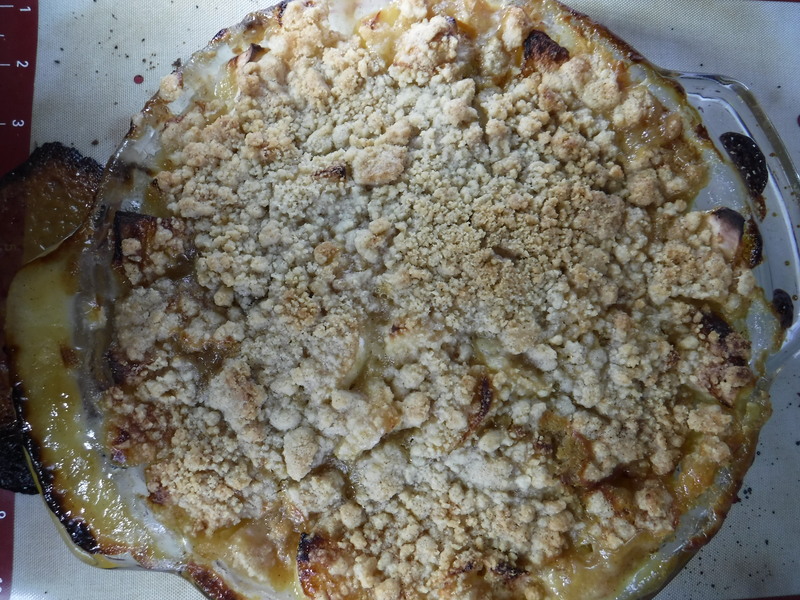 Bake 50-60 minutes until the apples are soft and the crisp topping is golden. Allow to rest at least 10 minutes before serving, warm or at room temperature, with ice cream, whipped cream, or plain. If car camping, prepare two baggies at home, one for the topping and one for the apple-custard filling, and keep both in a cooler until ready to bake in a cake pan floated on aluminum foil ropes placed on the bottom of a Dutch oven.